Spider plants make wonderful houseplants that are very easy to grow. But did you know that this common houseplant can also produce seeds? 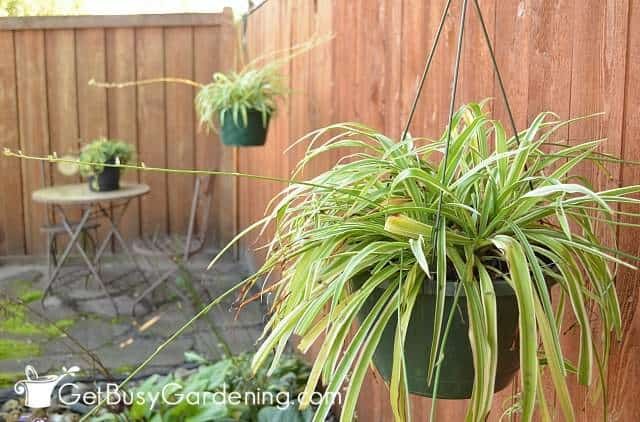 Yes, and it’s easy to grow spider plants from seed too! 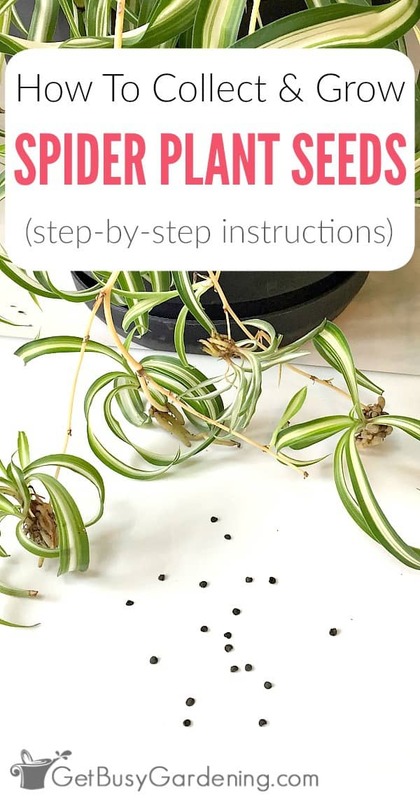 Here are step-by-step instructions for how to collect and grow spider plant seeds, and care for spider plant seedlings. I have three large spider plants (Chlorophytum comosum), and they never produced seeds until after I started putting them outside for the summer. Shortly after I brought them inside that first fall, I noticed that all of them were dropping seeds. So, of course I had to collect the seeds and plant them to see if they were actually viable. It was a fun experiment, and I learned a ton about growing spider plants from seed. Wait, Do Spider Plants Flower? Maybe you never noticed this before, but spider plants bloom during the summer. 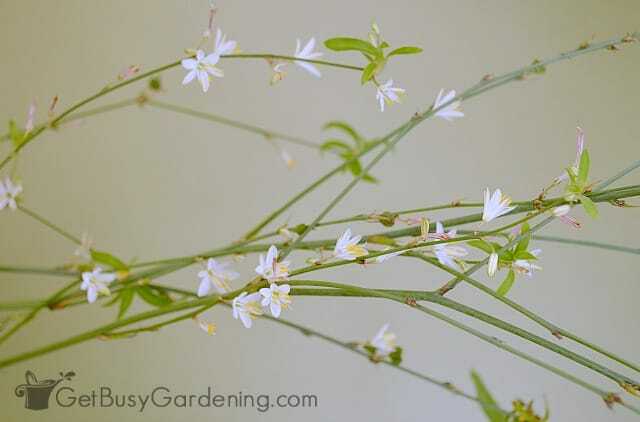 The tiny little white spider plant flowers are insignificant and, when left unpollinated, they will just drop from the plant. BUT, when spider plant flowers are pollinated… Yep, you guessed it, they will produce seeds! In order for a spider plant to produce seeds, the flowers must be pollinated. You can do this yourself, or put your spider plant outside and let the bees do the work for you. To pollinate spider plants yourself, simply take your finger or a cotton swab and gently rub the inside of a flower. Then use the same finger/swab to go from flower to flower, gently rubbing the inside of each one to spread the pollen around. If pollination is successful, then once the flowers dry up and fall off, a bunch of green spider plant seed pods will be left behind. Woohoo! 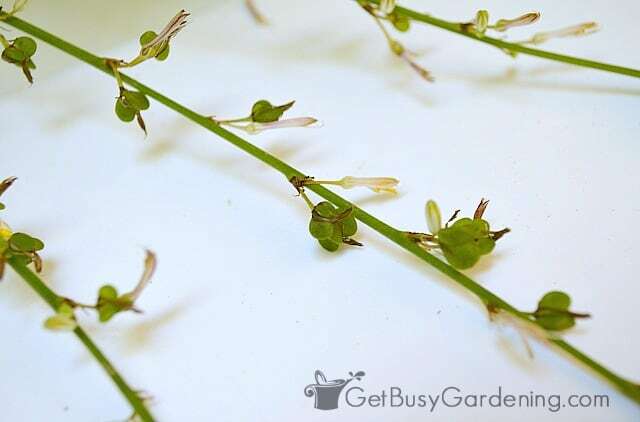 Allow the spider plant seed pods to dry out on the plant until they turn brown and start to split open. 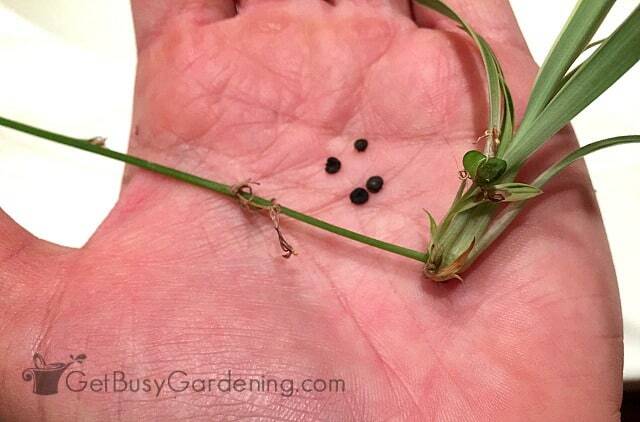 Once the spider plant seed pods split open, you’ll see black seeds inside. 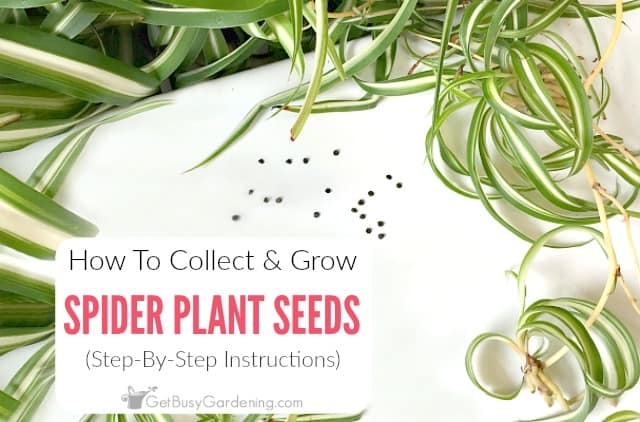 Spider plant seeds are the size and shape of garden pepper seeds. To make it easier to collect spider plant seeds, put the plant in a place where the seeds won’t get lost once they start to fall out of the seed pods. You could also clip or pinch off the spider plant seed pods as they start to split open, and drop them into a paper bag or container. Then shake the container, or gently pinch the seed pods to collect the seeds. Once you collect the seeds, they are ready to plant right away, or you can store the seeds for a short time and plant them later. But spider plant seeds don’t store well, so it’s best to sow them as soon as you can. You can plant each spider plant seed individually, or you can just plant the whole seed pod. Plant the seeds as you would any other seed, in a loose seed starting soil mix. The rule of thumb for planting seeds is to plant them twice as deep as the seed is wide. 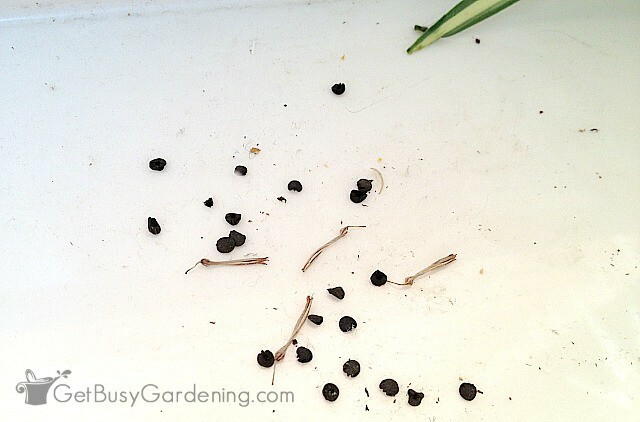 So, for spider plant seeds, plant them about a 1/4″ – 1/2″ deep, then cover them with dirt. 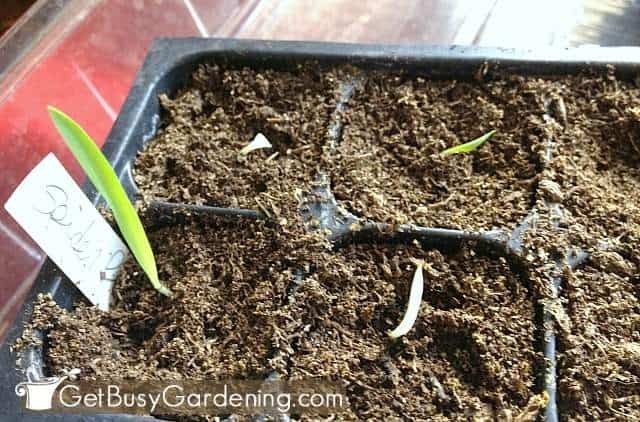 Keep the soil evenly moist until the spider plant seeds germinate. To help the seeds grow faster, put the seedling tray on a heating mat or over a heat vent (putting seedling trays over a heat vent will make them dry out faster though). In a couple of weeks, you should start to see tiny spider plant seedlings starting to emerge from the soil. It can take a month or so for spider plant seeds to germinate, so be patient. 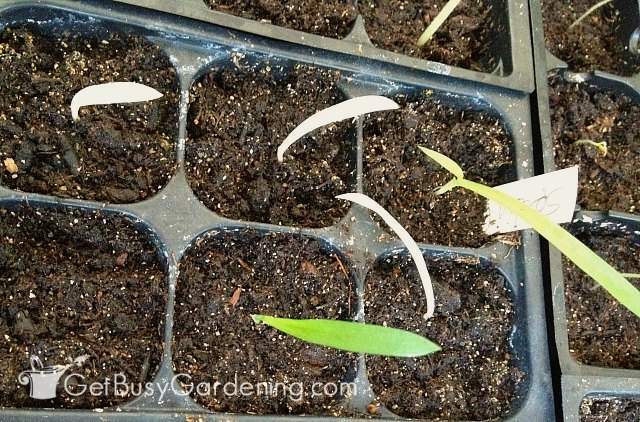 Sometimes it’s hard to wait to start potting up seedlings, but spider plant seedlings are very delicate. It’s best to wait until they have several leaves before repotting them. It takes several weeks for spider plant seedlings to get large enough to repot (the seedlings in my pictures are way too small for repotting). As your spider plant seedlings start to grow a few leaves, you can begin to fertilize them. 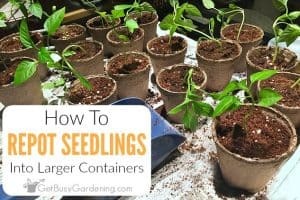 Start by giving them a weak dose of fertilizer, and then slowly increase it to full strength as the spider plant seedlings start to grow larger. I use (and highly recommend) organic indoor plant food, and an organic compost solution on my seedlings – they work better than chemical fertilizers and are much healthier for the environment. Fish emulsion also works great, but it can get a little stinky when used indoors. You can continue to use the same fertilizer throughout the life of your spider plants (only fertilize houseplants during the spring and summer months though). My experiment with starting spider plant seeds was a great success. In this experiment, I planted six seeds, and five of them germinated and grew into cute little spider plants. A few of the variegated spider plant seedlings even kept their variegation, which I’m thrilled about. Most indoor gardeners have experimented with spider plant propagation by rooting spider plant babies to produce brand new plants. But it’s fun to experiment with different ways to propagate plants, like grow them from seed. Plus you can share spider plant seeds with friends, or trade them for other seeds. I have never seen spider plant seeds for sale before, so I’m not sure where you could buy them. But mature plants can produce seeds every year, so if you don’t have a spider plant houseplant of your own, talk to your friends and neighbors to see if they’ll save seeds for you! Do you want to learn more about starting your own seeds? My Starting Seeds Indoors eBook is just what you need to get growing! 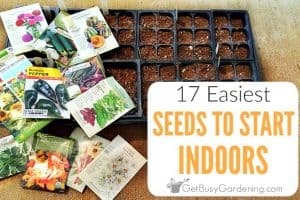 It’s a quick-start guide to starting seeds indoors and will have you up and running in no time! Download your copy now! 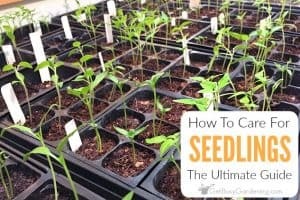 Want to learn how to easily grow all of your own seeds so you can save tons of money on plants every year? 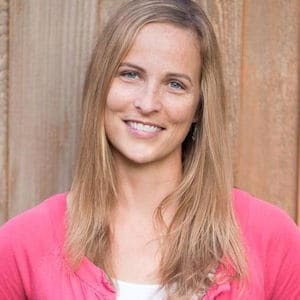 My Online Seed Starting Course is the perfect solution! 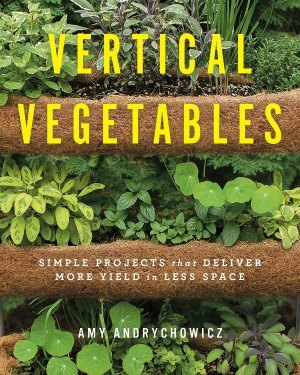 It will teach you everything you need to know in order to successfully grow any type of plant you want from seed. Enroll in the course and get started today! Have you ever grown spider plants from seed? Share you experiences in the comments below. Great post. I was given a very small spider plant last year and am hoping that it will set seeds this year so I can see if your experiment works for me too. Thanks! Good luck, hope you get some spider plant seeds this year. Great post! I didn't know spider plants had seeds. I've always taken cuttings to make more. I'll be on the lookout for seeds this year. Thanks for the tip! Thank you, and you're welcome! 🙂 hope you get seeds this year! Good luck. The key to getting successful seeds its to not seperate the babys. leave them on the plant to encourage more shoots and then you should start getting flowers. dead head the ones that dry out daily as this encourages more flowers and makes pollination almost impossible not to happen. my spider has 11 plus stems currently and is flowering daily with 20/30 flowers. Cool, thanks for the excellent tips! The tuberous roots are actually only water reservoir roots that is why its important to only water spider plants when the top soil appears to be majorly dry! My spider plant has almost 100 babies and about 75 seeds. It is fall in my zone and I need to know how to store the seeds until spring. Store them in a cool dry place. Spider plant seeds don’t really keep well, and will lose their viability quickly. So you should sow them as soon as you can. I wouldn’t keep them stored for more than 4-5 months, at the longest. I’ve never tested how long they will store and still remain viable. Here’s more details about how I store my seeds… Storing Seeds Spider plant seedlings are just as easy to grow through the winter as the mother plant is though, so even if you plant the seeds in the fall, you can grow the seedlings as you would any spider plant houseplant. Do you know of any one that’s sells spider plant seeds? I don’t. Sorry! I’ve never seen spider plant seeds for sale before. I am 42 years old. I grew up with my mother always having spider plants. My plant had produced flowers!! Mom never saw spider seeds developed before on hers…but when their kept indoors all year long bees can’t access the plant!! !So I used my finger as Mr. bumblebee and just touch my finger from flower to flower back-and-forth several times and it pollinated just fine!!! I’ve heard of using a artists brush to do the same. I grew up surrounded my spider plants too! My mom always kept them indoors as well, and they never got seeds. Very cool that you were able to pollinate the spider plant flowers yourself! Congrats!! I want to share my experience with my spider plant. It started out as my daughter’s work plant. It was very small & it looked hopeless, but she gave it to me. I leave it out in the summer, & it is so happy & healthy, & very very full. When I brought it in this fall, my spider plant started dropping seeds. 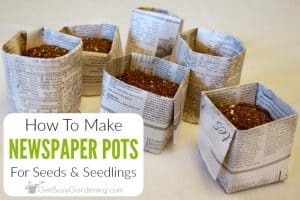 I didn’t realize what they were at first, & I was just throwing them away, but after I read the above information I was very excited so I planted all of the spider plant seeds in a small pot. I’m hoping I will get more spider plants. Thank you so much for your help. Very cool, I love that story! Thank you so much for sharing. So glad you found this post helpful, and I hope your spider plant seeds will grow great for you! Wow, interesting. I don’t know for sure why your spider plant doesn’t grow any babies. But my guess is that since the flowers are being pollinated, they are producing seed rather than babies. Do you keep your spider plant outside? No, I keep it inside. However, it did become infested with fungus gnats once. Is it possible that they did the pollinating? I finally got rid of them, thankfully. Thanks for the response. I will enjoy planting those seeds to see what happens. Humm… I guess it’s possible that the soil gnats could have helped pollinate them. But that would have been completely by accident because soil gnats don’t care about flowers. Weirdness. 🙂 Glad to hear you have the soil gnats under control! So cool. My mom has these at her house, but I don’t know if she knows you can get seeds from spider plants. I had no clue spider plants could have seeds, i know that sounds silly. I was wondering how do you pollinate the flowers by hand ? I have not put any of mine outside to be pollinated,and yet one of them has a seed pod. Yes. To pollinate the spider plant flowers you can just use your finger to spread pollen around from flower to flower. Where can I buy spider plant seeds? I volunteer at a community garden and the kids want to grow some indoor plants. I can’t find seeds anywhere. Suggestions? I have never found spider plant seeds for sale anywhere before. It would suggest asking around to see if any of your friends have spider plants that you can try pollinating to collect the seeds. Good luck! I was gifted a spider plant yesterday… So I am very excited on how “Lucy” will turn out. Wonderful, enjoy your new baby spider plant! Ohmygosh! I had no idea there were seeds!! I brought mine in from the back porch in October and it was still blooming! I’ll have to look for seed pods. Do you know anything about growing roses from seed? I picked a seed pod/ rose hip from a very prolific Bush and popped it into a pot of soil and forgot about it. Just noticed yesterday that there’s a seedling growing! Awesome! I hope you’ll find some seed pods on your spider plant! How fun that you were able to grow your rose from seed.